In an incredible coincidence, I lost my cars keys at the Enormous Chicago Auto Show this afternoon, and got them back almost immediately due to some wonderful people whom I don’t know. I had parked in the large indoor lot behind the McCormick Place show building. The place was swamped with kids and others with the day off — President’s Day. When I left, I paid my ticket and stepped into the garage and started fumbling through my pockets for my keys. Not finding them, I walked over to a garbage can and began spreading out the contents of my pockets to complete my self-search. I had also left my cell phone in the locked car, so was contemplating my next step. Just then, and attractive young McCormick Place employee stepped up and asked if I’d lost keys, and asked what kind of car I had. She asked if there was a micro flashlight on the key ring. Yes! She had already turned them into the office, so we walked the few steps over there, and wa-la, I had my key back. She said a woman leaving the show had handed them to her a short while before. What were the odds? A show with a thousand cars and thousands more in garages, tons of people crowding everywhere, multiple garage entrances. A responsible person who must have seen the keys on the floor, somewhere, who turned them into this responsible employee, who immediately took them to the office, and then was on the alert for someone who looked like they might have lost their keys! I love these people! And, by the way, another great auto show, with all the latest on display. The prototype Buick Avenir sedan is the classiest thing to come out of Detroit in years. Of course, the new Mercedes Mayback is even classier. Align the People with the War: Bring Back the Draft! On Morning Joe today, they discussed the dichotomy of a new NBC-Maris Poll that shows that 64% of Americans would support moderate to heavy commitment of U.S. ground troops to the middle east, while each guest declared that almost everyone they meet of every political persuasion says that we should NOT again commit ground troops to the middle east. Here’s my theory of explaining this contradiction. When the majority of those surveyed by NBC said yes, we should commit ground troops, they were referring to our professional military soldiers and sailors, not them or members of their own family. But when you ask people individually, they are thinking of themselves, and don’t think we should go. The military DRAFT is a dirty word, because most Americans don’t want to risk their own loved ones being compelled to serve the nation, but we are less sensitive when polled and think that others (the professional military) would go on our behalf. I don’t love the idea of a draft. I was subject to the draft when I graduated college in 1966, so enlisted and served 3 years as an officer. But I didn’t like the service, and though I called it “my military MBA,” the truth is that it set me back professionally in relation to my friends who didn’t serve, and it caused family disruptions that changed the course of my life. But I think a draft is a good thing, because it serves to align the thinking of the people with the decisions of our government, and vice versa, and as we know from the Vietnam experience, public opposition ultimately served to get America out of that war that never should have happened. Our military is thinking in terms of a “long war” in the middle east, that might go on over 40 to 60 years! It’s time that the American people think in terms of themselves (their own families), rather than in terms of “other” Americans (a professional military), serving on the ground in such a long war. Then, and only then, will they express themselves clearly to our political and military leadership, and let democracy, rather than bureaucrats, determine our nation’s future. Famous, adventurous newsman Bov Simon’s death yesterday in a West Side Highway car crash in NYC, raises a probable lesson. he was reportedly riding in the back of a town car, likely a Lincoln, and there were two drivers in the front seat who survived. Having traveled thousands of times in so-called town cars, I do not recall ever being asked or even reminded to put on my seat belt. Why? Perhaps because the perception that riding as a passenger in such roomy vehicles with their living room-like rear seat areas is like being in an office or reception room, where one would not be strapped-in like driving in a regular car. In an accident, the un-seat-belted passenger in such a roomy back seat would be tossed around like a tennis ball in an accident. I don’t have all the facts, but I suspect this is what happened to Mr. Simon, who survived so many dangerous foreign assignments over his stunning career. If so, there is a suggestion for change here. I’m not much on war movies, but I guess with the Oscars coming up, I finally caught up with Bradley Cooper in American Sniper, Brad Pitt in Fury, and by mistake while looking for Fury, a 2014 film called Ardennes Fury starring no one ever heard of. I had some basis for “expertise,” in that I was commissioned an Armor officer, after graduating from the Armor School at Fort Knox through OCS in 1967, nearing the height of the Vietnam War. 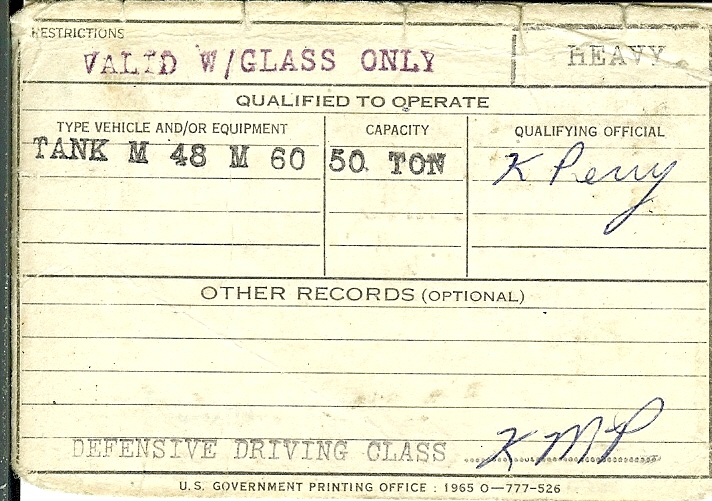 I earned my Tank Driver’s License in the M48 and M60 main battle tanks in service at the time, though I never entered the hatch of a tank after Armor School. Back to the movies, I was struck at how in Fury, depicting Sherman tank action in Germany near war’s end in WWII, that the lieutenant in charge of the tank platoon was depicted as a timid guy in a crisp green uniform (who was blown up early in the film), while Brad Pitt was the seasoned non-com (with a 2015 hairdo) who was the real leader and father-figure of the unit, which was staffed by rumpled ner-do-well’s of low pedigree. The Germans were portrayed as ruthless, which justified the same behavior by the Americans. All were savages, and it was a clear anti-war film, grisly and disgusting, even when desperation and bravery prevailed. The other tank film,Ardennes Fury, was a cheaply produced film with almost no plot, wherin an isolated tank crew at the edge of oblivion in the Battle of the Bulge in Belgium’s beautiful Ardennes forest (which we visited last year), break out to try to save an orphanage staffed by nuns. I don’t know how it came out, though I suspect they succeeded. And then there is American Sniper, where Bradley Cooper transforms into the most famous sniper of our recent set of wars. He suffers from PTSD, yet returns for multiple tours of duty voluntarily. He does as told, because he believes he is saving American lives. He personifies the perils of today’s professional soldiers — estranged from the comforts and safety of civilian lives, and in a final irony, just as he is re-assimilating, a veteran with PTSD he is trying to help, shoots him on a firing range. This too, to me, is an anti-war film, though it appears that to many Americans, it is all about heroism. I just don’t get that. I got nothing out of any of these films, other than a harsh reminder of the rationalized, institutionalized, insane violence called war.